I'm slowly working my way to becoming Clark Griswold. 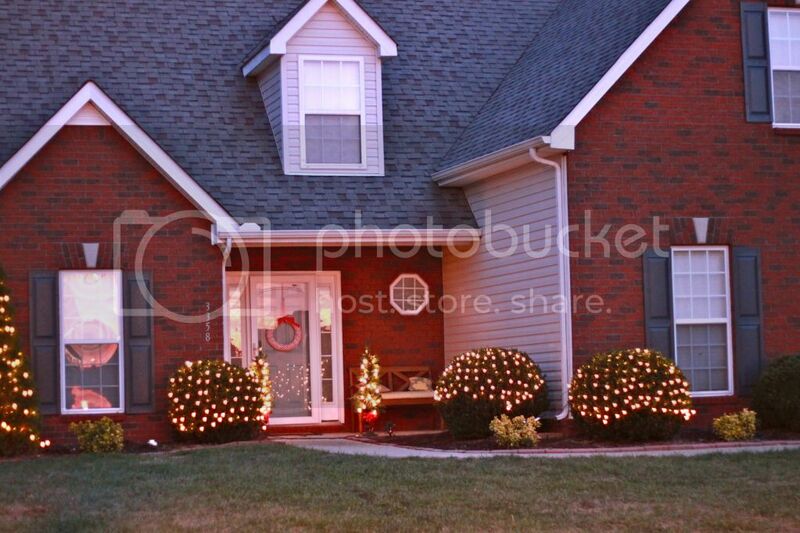 Last year we got the tree porch topiaries and had the two outer bushes lit, this year I added the net lights to all of the shrubs so our house truly shines. Next year....roof lights and an increased life insurance policy for Michael. I have to blame thank Ethan for this new wreath. I made an ornament wreath last year, but when I got it out this year Ethan proceeded to pull all the shiny bulbs off of it. 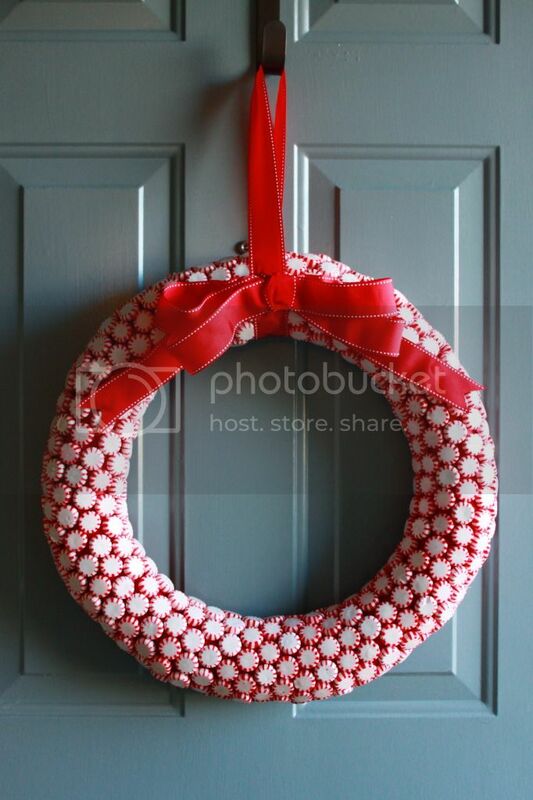 So alas, here is a new, Pinterest inspired, peppermint wreath! Tutorial for this baby can be found here. The first thing you see when you walk into our front door is our dining room. 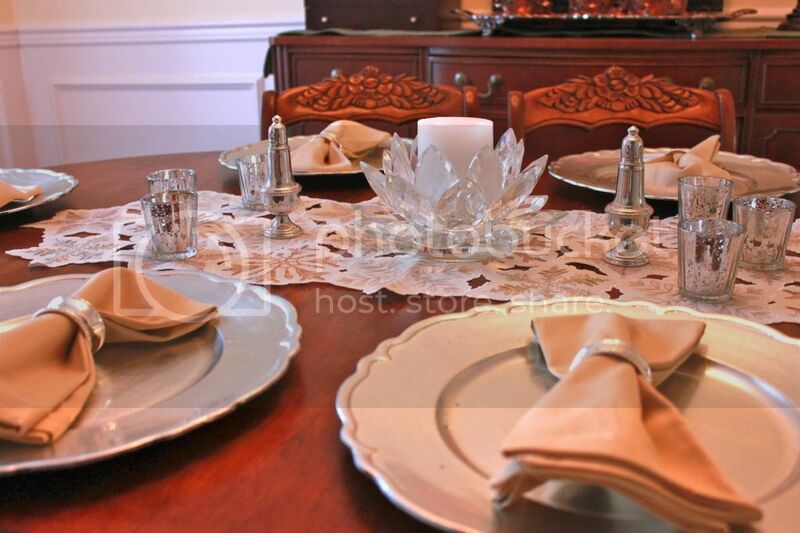 That room is a work in progress but here is our holiday tablescape. I fully informed you all on how to properly host a dinner party yesterday so today I'll go more into detail on the tablescape itself. I bought the silver chargers last year for a dollar a piece, I found everything else (minus the center candle, salt and pepper shakers, and napkin rings all of which were wedding gifts) at Target. The votives were a $1 a piece and the napkins were $2.50 for a 2 pack. 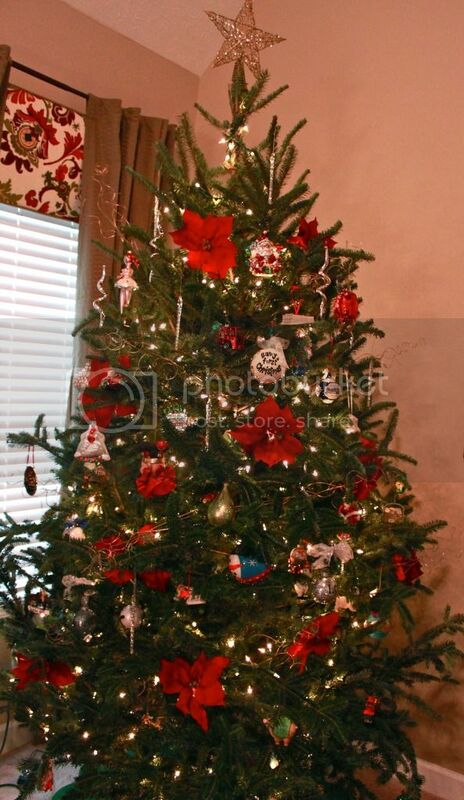 I have to admit that this year's tree is not my favorite. I'm not sure exactly what we were thinking when we picked this as "The One". I'm normally super picky, but when we got it home and I kept telling my husband..."keep turning, more, more, maybe try the other way? "....I realized we'd gotten a dud. I'm 98% positive this thing might keel over on us by next weekend. That's okay though. Our Christmas trees are always an adventure and to be honest we always smile and laugh about it afterwards. It's all about the memories in the end. The mantle is currently lacking stockings. I made stockings for me and Michael the year we got married and Ethan's is currently in the works. He will have a stocking for Christmas, I promise. 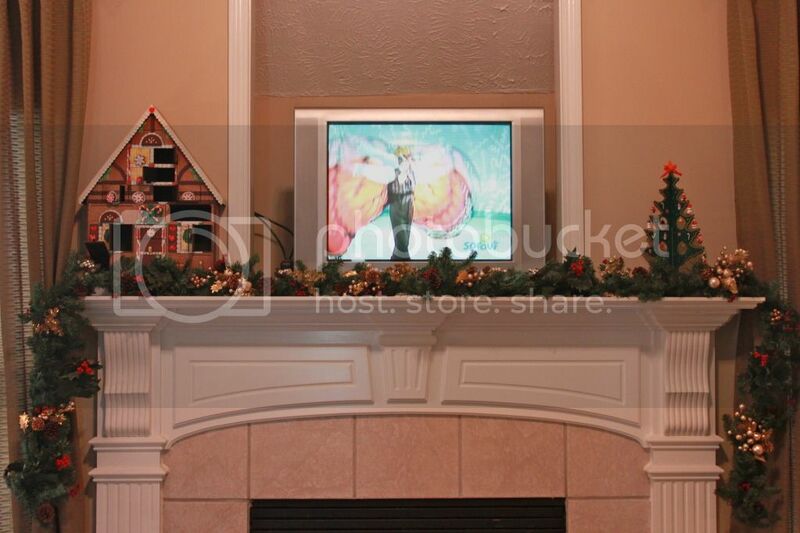 What the mantle does hold though is our Advent calendar and Kurt Adler Christmas tree and a TV showing Mr. Noodle (Sesame Street anyone?). I added some flair to the banister this year although I do think I'll upgrade it a little bit next year. I kinda just threw together some leftover stuff I had laying around, but it works for now. I also used my ribbon and clothespin idea from last year to hang our Christmas cards in the foyer. Finally I've got a couple of special things just for Ethan. I hung glittery snowflakes and crystal ornaments from the kitchen chandelier last year in hopes that it would catch his 2 month old attention and it most certainly did. I couldn't help but do it again this year and while he doesn't get as much enjoyment out of it now, I still think of it fondly. I also put a small metal tree in his room and his Grandma gifted him a snow globe night light. Snow globe nightlight + Light socket + 14 month old = tons of fun....annnnnd lots of supervision. That wraps up all of my holiday decor! It's always a work in progress and I can't wait to add a little more and upgrade a little next year. Hope you enjoyed your tour! 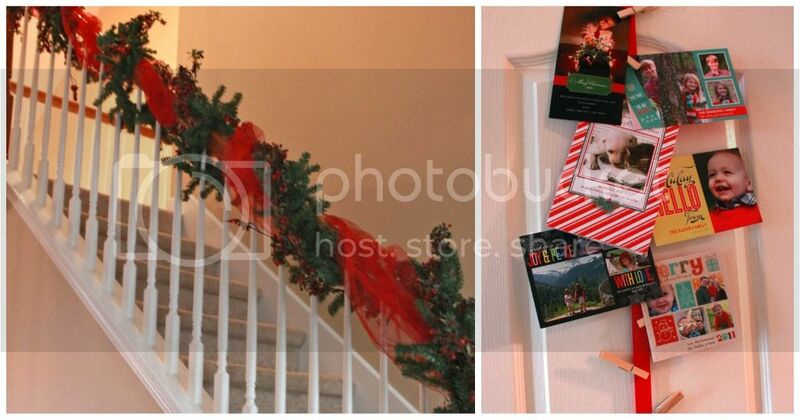 Love that wreath and your bannister! So pretty! Wow you did a great job! LOL I've got to get more decorations b/c I realize I don't have that many. Maybe next house! I love the Advent Calendar...where did you get it? Your house looks great! Love all of your little decorations around the house! I realized our house is looking sparse so I'll be heading out after Christmas to get some decoration deals! Oh and I LOVE the new wreath!! You did a great job! every little detail is beautiful... your house is perfect. I adore the outside. Absolutely gorgeous!! I am so envious because I wanted to post about my decor except its not up :( everything looks amazing!! Cute wreath!!! I also like how you displayed your cards- simple but cute. Hope you don't mind me linking to your blog for that idea!!! Your home is gorgeous! Love the wreath. Well, I love everything :) The nightlight is too cute!! your wreath looks great! i love all of your decor and how you displayed your christmas cards... i need to come up with some fun way to showcase mine. OMG - I totally heart that wreath! Damn pinterest, it gets me everytime! Your wreath is so neat! love the way your peppermint wreath turned out!! Love the peppermint wreath! I will have to check out the tutorial! Love it! I love your wreath too!! That wreath is awesome!! And we have no outdoor decor and it makes me sad. We will definitely be stepping up the game next year. Beautiful tree. I love what you did with the banister with the ribbon(think it's mesh not sure). Very pretty and very festive! I love that peppermint wreath. So pretty.